The taste of the chutney is both sweet and sour. Just to balance the taste of kiwi, I added raisin and apple. The chutney got very nice aroma and taste. 1. Cook all the ingredients except oil and cumin along with 1/4 cup of water. 2. Once cooking is done, heat 1 tsp oil, temper cumin. 3. Add the cumin to the chutney. Wow Nithu, this is so great !!! did you just think of making it or have been doing it for a while. Hats off to your creativity and imagination. a very delicious,nutritious and decorative piece of artistic recipe.No words. great nithu! u r so creative, the presentation looks lovely too!! Hi Nithu,Wow.. this is a super good combination and absolutely unpredictable.you r so creativity... it looks very tempting..
Hello Neethu, entirely a new chutney for me.My mouth is watering here. Nicely presented. All the best. Hope you win the event. Beautiful dish with beautiful decorated.. looks fantastic. delicious chutney with a lovely decoration. Wow! That looks and sounds amazing! Your presentation is absolutely beautiful! I really enjoy reading through all your wonderful recipes. Way to go, Nithu! Very delicious and healthy chutney. Love the combination of kiwis and raisins here. Amazing presentation and the click is fab.. 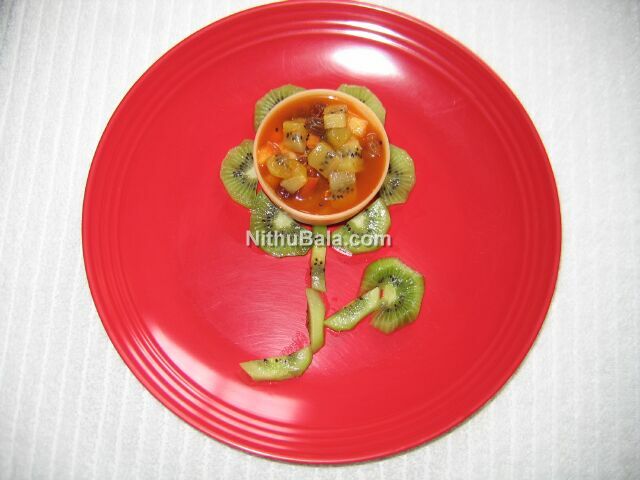 Such an innovative chutney, truly yummy..
this is creativity..great combo..love the presentation.. Innovative chutney. Never in a million years I would be have thought of this combo. Where does one even think of such a combination!!! Very interesting. Looks incredible...good way to eat fruits. I was just showing your blog to my friend! She just loved your blog:) We were wondering how you came up with such an unusual thought of making chutney?? really interesting and I loved the picture, flowery fruit chutney! Simply Wonderful Nithu!